The following article is taken from The Salisbury Munitions Tramways by F. Brian Andrews. Early in WWII four munition facilities were constructed in South Australia: a small arms ammunition factory at Hendon; a foundry and rolling mill at Finsbury; an explosives and filling factory at Salisbury, and a magazine area at Smithfield. All of these establishments were serviced by the South Australian Railways (S.A.R.) broad gauge (5’3) branch lines and associated sidings. In addition the Salisbury factory and Smithfield Magazine had a total of four narrow gauge tramway systems. The No. 2 Explosives and Filling factory which sprawled over four and a half square miles of plain in the Penfield area was completed and in production by mid 1942. By January 1943 the weekly out put was 80.000 25-pound shells, 45,000 3 mortar bombs and 10,000 contact mines. It employed 6,500 persons working a six-day week around the clock in three shifts. It was served by 25 passenger trains daily of which nineteen were from Adelaide, the other six from Gawler, Hamley Bridge, Tanunda, Angaston and Kapunda via an especially constructed connecting curve from the main North line to the Penfield branch line. Special arrangements were made for factory workers arriving by train in Adelaide at 12.43am off the afternoon shift. In addition to late trains to all suburban destinations, there was an early morning tram service departing from North Terrace opposite the Adelaide Railway Station. The broad gauge Penfield branch loop line more or less bisected the Salisbury establishment and branches spurred off this line to both east and west. In addition to these there were three narrow gauge systems which could be termed production facilities inasmuch as they were used for transporting materials at various stages of production. The T.N.T. Section had a 2ft. gauge tramway laid on a 4ft. wide concrete bed consisting of 390ft. of single track with a crossing loop. Four tipping push-trucks were used on this system. The tramway system in the percussion cap manufacturing section at the southern end had an 18in. gauge track consisting of two lengths of 215ft. and 265 ft. which was used in transporting the cap filling compound from storage to the cap filling house. The trucks were hand propelled. A third track 345ft. long transported the filled caps to the drying house. 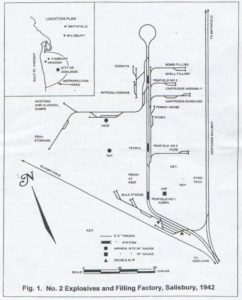 The Acid Section was served by a broadgauge line branching west from the Penfield line and with its own loop line and shunting spur. It had a total track length of 4,070 ft. The basic materials were railed into the section over the branch line. A further 2ft. gauge line was used to convey material from the stores to the retorts. A total fleet of 36 hand pushed skip trucks of 23 cwt. capacity were employed on the task. The track layout made extensive use of turntables (15 in all) in addition to five sets of points. The completed munitions were transported by rail to the user ammunition depots or by road transport into storage at the Smithfield magazine.